The LG G7 ThinQ isn’t showy, but it’s certainly one of the best handsets LG has ever produced. It’s designed well and offers audio quality that’s second-to-none in the mainstream smartphone market — a core strength for LG. Less expected is the fact that LG significantly improved the camera over previous handsets. 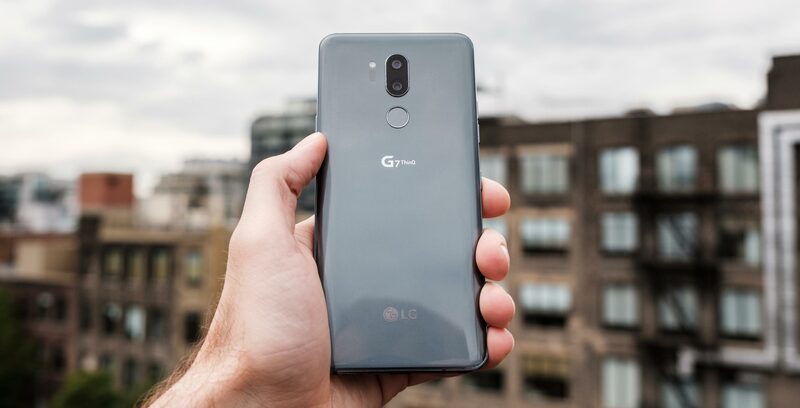 While there are some aspects of the phone that leave much to be desired — battery and UI being the main challenges — the G7 ultimately represents a high-quality offering from the brand that’s easy to recommend. Before I go any further, I should note that I spent time largely with a pre-production unit, followed by several days of use with a production version of the phone. 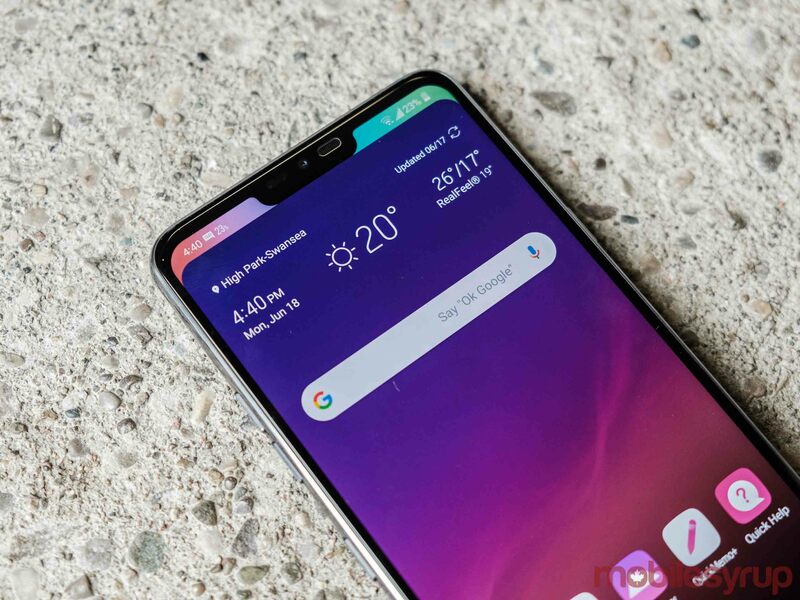 The first thing you’ll notice about the LG G7 ThinQ is its sensible good looks. 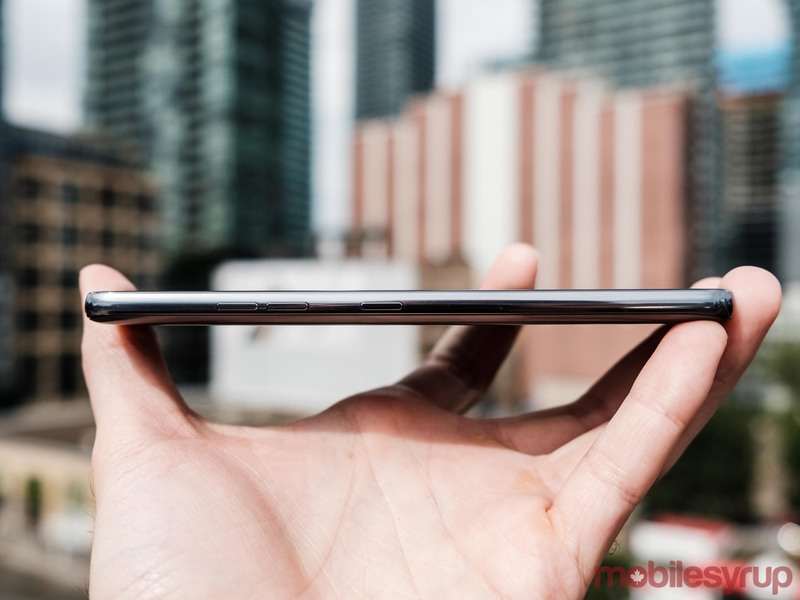 Hyper slim bezels, a notch (now ubiquitous in the smartphone world), curved aluminum sides and a grey or black back panel covered by Gorilla Glass. 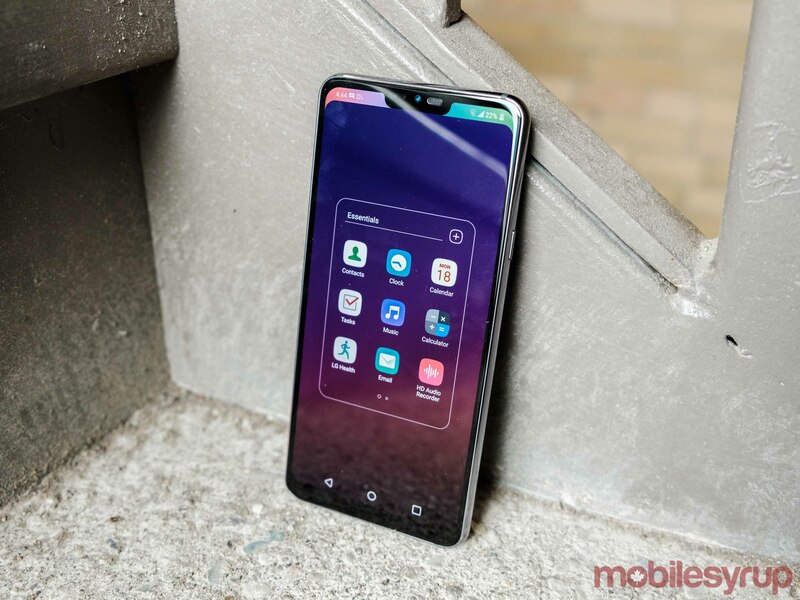 The device is a tad heavily branded on the back with two medium-size logos, on for G7 ThinQ and one for LG, but it has a fingerprint centered in just the right spot on the rear and a neatly aligned camera. Everything is in its right place, and the device feels good in the hand; solid and well-balanced, though not heavy. By appearances alone, this is a device that can stand proud among the rest of the smartphones on the market today. But appearances are only one part of a much larger story, and as smartphones grow to look more and more alike, its importance is shrinking. Software and performance are the most important factors, now more than ever. 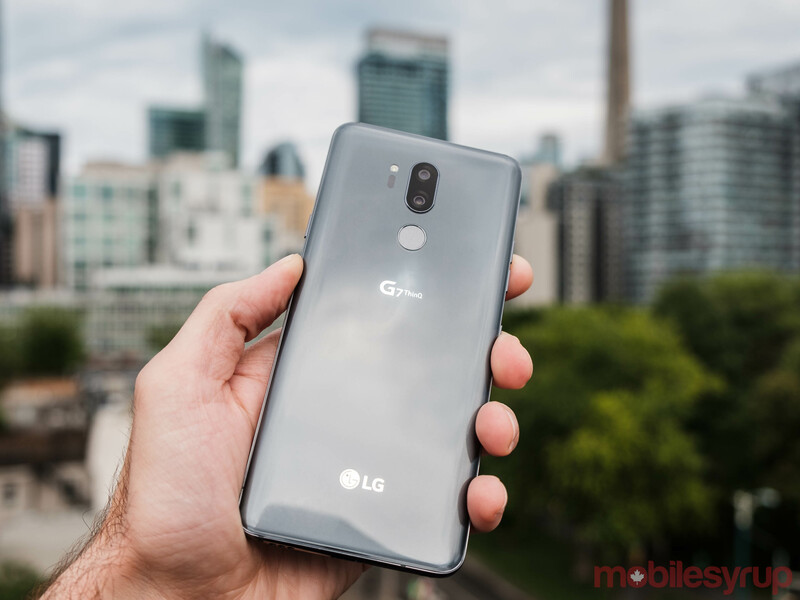 In these realms, the LG G7 ThinQ makes itself a solid option, butnot a first choice. ThinQ is LG’s AI branding across a variety of different products, from appliances to TVs, so the addition brought this company-wide focus to its mobile division, where several devices are now tagged in the same way. There are two main things that serve as the AI focal points of the device. There’s the AI camera, which I’ll go into in more depth later, and the dedicated Google Assistant button. That’s useful, but the placement of the AI button not so much. Generally, I hold my device in my right hand with the bottom resting on my pinkie finger, making it easier for me to simply press down on the virtual home button to launch Google Assistant than crane a finger over to squeeze the button. Additionally, it would be nice if, when done with Google Assistant, you could exit the feature with a click of the same button, but that’s not possible. Having said that, the button certainly never got in my way, and is generally a bonus, not a detractor — it’s just not that compelling. 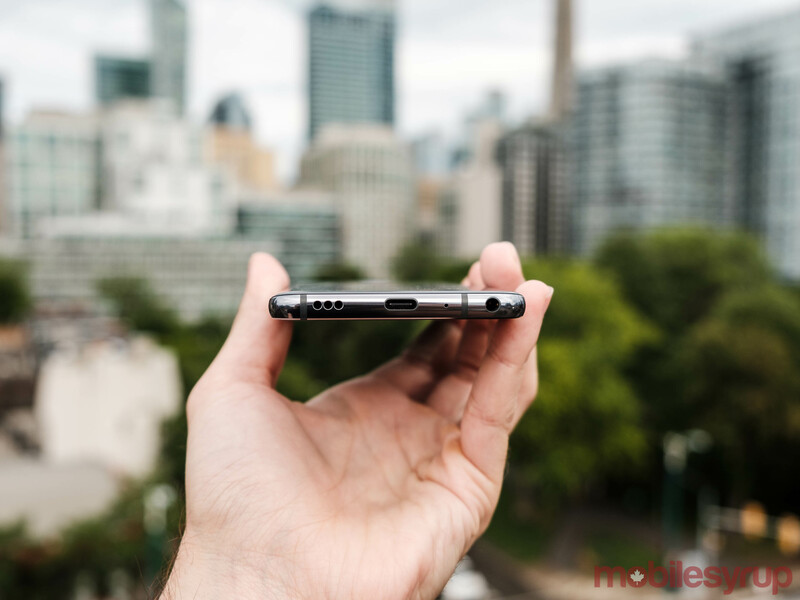 In terms of other noteworthy design elements, LG decided to continue with inclusion of a headphone jack, an extremely endearing quality. While it’s true that we’re certainly moving towards an audio future dominated by wireless headsets, that still feels frustratingly elite and inconvenient to me. To top it off, the device offers 9W wireless charging and is IP68-rated for water resistance up to 1.5 meters and 30 minutes. Turning to display, I quite like the LCD panel, which seems to be the result of LG distancing itself from the disastrous, and in my opinion overblown, OLED burn-in issues of the Pixel 2 XL. It’s exceedingly bright, crisp and deeply saturated, though it skews toward blue tones. I should note that while I myself haven’t experienced any backlight bleed with either my production or pre-production unit, it has become an issue for some LG G7 ThinQ users. Turning to the other major AI element, the camera, I found it if not a disappointment, much less than exciting. The shooter’s interface provides automated suggestions for camera settings based on LG’s on-device object recognition software. For instance, open your phone’s camera on a puppy, and it’ll give you some special settings for pet photography. It can be sluggish but will generally land on the correct option. The real question, though, is whether that adds much overall value. Personally, it wasn’t quick enough and didn’t yield such impressive results that I found myself going back for more. While there may be a good many positive things one can say about the G7, I’m not sure consumers which actually consider this the primary bragging point. As for the overall quality of the dual 16-megapixel shooter, I was pleasantly surprised by its higher dynamic range in comparison with past LG premium handsets. I was able to capture scenes with pops of light and areas of shade without losing much detail in either extreme. Further, colours came through strong and vibrant. The issue I’ve generally experienced with the over-sharpening that occurs through software processing with many LG phones is mostly gone, as well. In low-light conditions, the camera setup tended a little more towards over-processing pictures by seemingly amping up colour saturation and doing a bit more sharpening, but generally the shots still came out nice enough to share. The wide-angle camera feature was, as always, a delight. I found it useful in so many situations, from taking photos for an apartment listing to better capturing the full scope and beauty of a natural landscape. The front-facing camera also provided detailed and nicely saturated pictures, though sunny backdrops were far more likely to be blown out than when using the rear cameras. While it wasn’t highlighted as one of the main marketing points for the G7, consumers generally know by now that LG stands for high-quality audio, and this device is no exception. With wired headphones, the device provides lush 32-bit audio full of energy and life. The sound is well-articulated with plenty of detail and thanks to its DTS:X object-based audio codec, it’s great at providing imaging — the sense that a voice or instrument is coming from a certain place in your surroundings. Overall, it’s lovely. While many smartphone makers are putting the emphasis on wireless audio rather than quality audio, LG is still providing an oasis for the audiophile and their high-end wired headphones. The G7’s ‘Boombox Speaker,’ which uses the inner space of the smartphone as a resonance chamber, is also exceptional. I’ve hands-down never had a better experience with playing a music out loud with a phone. The sound throws surprisingly far, and remains full and pleasant until turned up to the very highest level, when it becomes just slightly hard and metallic. The G7 provides middling battery life with its 3,000mAh power source. On heavy usage days (an hour or two of video streaming, several hours of music streaming), it would manage a work day but generally conk out in the evening if I had to transition to an after-work event. Not that it’s surprising, given the size of its battery and the power of its processor, but 12 hours of life was generally the norm. Slight overheating was an occasional issue. The powerful processor mentioned above is, of course, Qualcomm’s Snapdragon 845, currently its flagship smartphone chipset. Performance was always fast, handling processing intensive applications with ease. The G7 was also almost entirely reliable, though there were a few instances of app crashes. UI is a sore spot for me with LG, admittedly. I’ve never liked LG’s skin, which this time runs overtop of Android 8.0 Oreo (there’s a planned upgrade to Android P on the way, as well). It strips out much of what I like about Android, without providing adequate replacements. For instance, there’s the Google Now screen, which one can only recreate out of widgets or by using LG’s ‘Smart Bulletin’ feature, which isn’t the same, because it doesn’t carry custom-picked news stories. The launcher that features an app drawer (as opposed to the home screen-only option), is also looking a bit outdated now that UI is moving increasingly towards gestures, rather than buttons. Potential buyers will no doubt be more concerned about the frequency of software updates — but while LG isn’t known for a swift pace with software updates, it has set its sights on improving. In April, the manufacturer announced a dedicated Software Upgrade Center — a physical facility in charge of providing customers with “faster, timelier, smartphone operating system and software updates.” Only time will tell how that pans out. 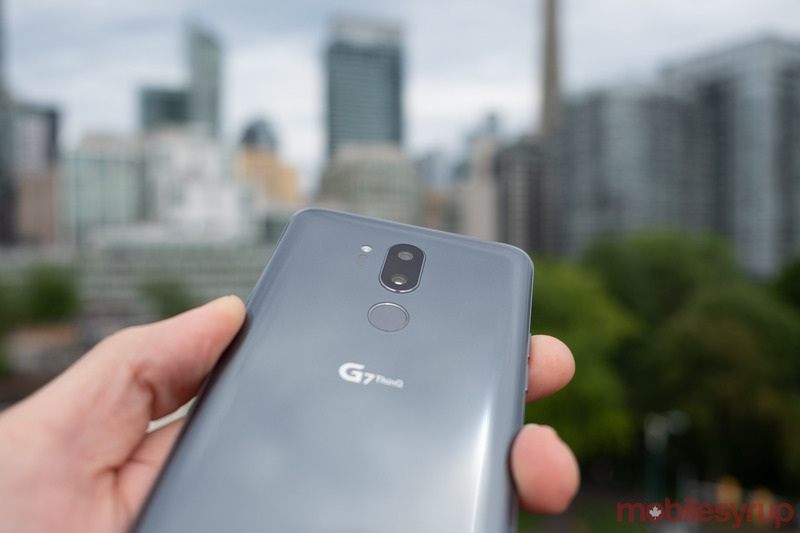 LG’s G7 ThinQ is a well-built, attractive and capable phone with amazing audio and a much-improved camera experience over its predecessors. It’s hindered only by mediocre battery life and a poor user interface -- though from a business perspective, one might consider its AI branding a misstep as well. While the smartphone has a lot of strong points, AI really isn’t the most notable, and the extra ‘ThinQ’ on the end of the G7’s name is a mouthful that feels silly to say. Toss out any preconceptions about AI or a massive change, though, and you’ll find a significantly enhanced G-series device that’s well worth considering. "[The LG G7 is] a significantly enhanced G-series device that's well worth considering."